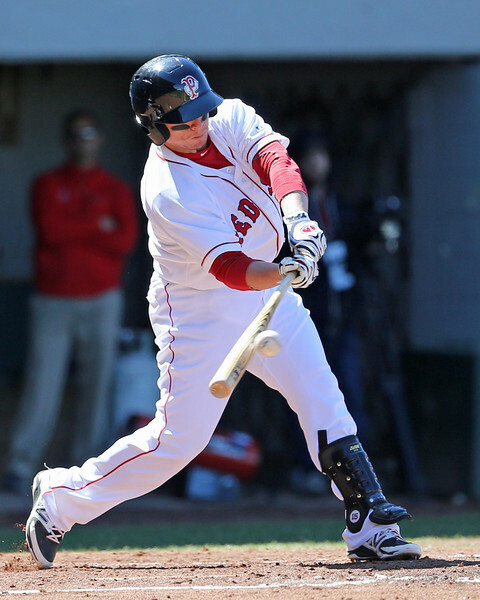 Chaz Fiorino is the newest addition to the SoxProspects.com scouting staff. In his new series, The Write-Up, he'll provide detailed scouting reports from the field. The format may evolve a little, but we are excited to add Chaz's expertise to the fold, and look forward to his reports. The soon-to-be 23-year-old left-handed hitter is listed at 6-foot-3, 220 pounds, with an athletic build, strong lower half and room for potential additional strength in his upper body. His incredibly advanced approach and hit tool, which grades around 65/70 on the 20-80 scale, are well-documented and were on display all series. There is no question the hit tool will play at the next level. Here, last Friday, Cecchini showed the ability to move laterally to his right, getting in front of the ball and making the throw over to first base. Again, on this play last Saturday, he flashed ability to move laterally to his right on a ball deep behind the bag, gather his feet, and throw over to get the slow runner, Maikel Franco. 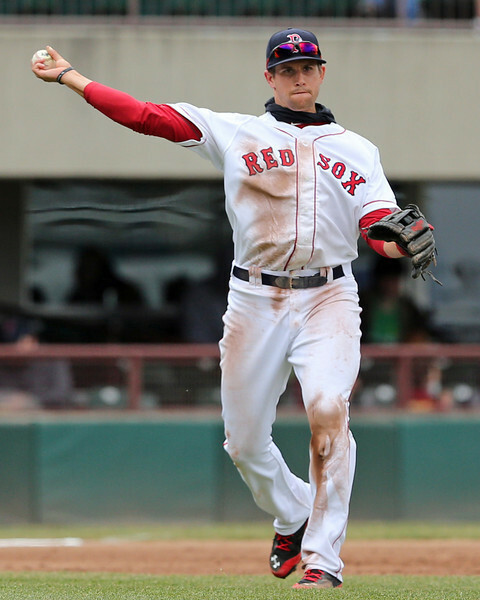 Those two plays were highlights defensively for Cecchini during the opening series and showed promise for the future. His first-step quickness to his left is a lot slower and rigid right now. His footwork when moving in that direction often looked awkward and uncomfortable, even if he was able to make the play. On Sunday, he charged one broken-bat slow-roller, tried to gather his feet, and made an awkward hop step before making a weak throw that sailed over the head of Alex Hassan at first base. There were a few other balls on the ground to Cecchini’s left that he was unable to react to in time to reach, and I noticed one warm-up throw on Sunday that he sailed over Hassan’s head as well. Gaining consistency will be the key for him defensively, as noted by Pawtucket Manager Kevin Boles on Saturday. Overall, he is a little rough around the edges now, but I see him ultimately becoming a serviceable defender with continued experience and repetition. Offensively, Cecchini stands pretty much square and slightly upright, with his hands in good position to hit. He tracks the ball extremely well through the zone and has a very advanced understanding of the strike zone, as well as what he can and cannot handle. He almost always got himself into hitter’s counts this series, and was able to continuously get his pitch. When he did, he smoked a few line drives up the middle, barreling the ball up consistently. The only question mark offensively is whether he will develop the power to profile at third base. There’s not much load, if any at all, in his swing to generate power. Rather, it is an easy swing geared towards sending line drives to all fields. I think there is more natural power to come, even if Cecchini does not change his approach to sell out for power—which he has no inclination of doing if his interviews are any indication. I think the power will manifest itself more in the form of doubles in the gap. Cecchini’s natural instincts are excellent and he shows plus effort in all areas, as well as advanced game knowledge and understanding of himself as a player. He is aggressive on the basepaths and always looking to take the extra base. By the end of 2014, the future should be more clear on how/where he will be able to stick at the major league level. I see a future high on-base percentage, 12 to 15 home runs, 30-plus doubles, and an average defender at third base. At age 23, listed at 5-foot-9, 195 pounds, Vazquez is pretty much maxed out physically. He has a thick lower half and big-bodied chest, and he certainly looks the part behind the plate. Given his frame, I have no questions about his strength and durability to handle the position over the course of a full season. This year, Vazquez will be able to get the rest he needs as well, with Ryan Lavarnway and Dan Butler on the roster. Given his thick build, Vazquez shows great agility with an active lower body, quick feet, and great mobility. His arm strength is elite, with some of the quickest releases and pop times you will come across, coming in consistently under 1.9 seconds. On Thursday night, Vazquez put the arm on display, throwing out a runner at second base despite the runner getting a great jump and the pitch being a breaking ball . Right now, he could comfortably play the position at the major league level. Offensively, Vazquez stands quietly with a square stance, slight crouch, feet shoulder-width apart, and his hands in a great position to hit. Based solely on this look this series, I see little reason to believe the bat would not play at the next level. Vazquez shows great understanding of the strike zone, makes consistent contact and showed the ability to drive the ball to all fields. While notching five hits this series, Vazquez showed the ability to extend on fastballs up and away in the zone, as well as the ability turn on balls inside to pull them to left field. He also showed the ability to shorten up with two strikes, putting a nice inside-out swing on a 2-2 pitch to drive it to right field for a base hit. His batspeed is average, and the power will come with time. His power currently grades 40, and I could see it developing to a 50 with Vazquez hitting 15 to 20 home runs down the road. Given how low the average offensive output is from catchers at the major league level (.245/.310/.388 average in 2013), I think Vazquez is certainly capable of holding his head above water at the plate at the next level. Combine that with his elite defensive abilities, and you have a potential plus player at a premium position. Chaz Fiorino is a Northeast Scout for SoxProspects.com. Follow him on Twitter @cbfiorino.